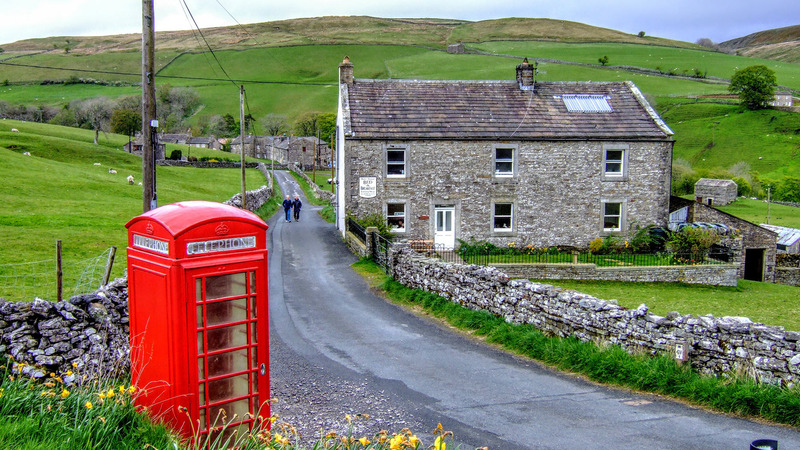 The Herriot Way is a 52 mile (84 km) long distance path that runs through some of the best scenery in the Yorkshire Dales; including the world famous Wensleydale and picturesque Swaledale. Along its length walkers will visit beautiful valleys, high, open fells and rolling, heather-clad moorland. The route crosses one of the highest points in Yorkshire, visits historic monuments and passes through a barren industrial wilderness; laid bare through lead mining. Anyone walking the Herriot Way will have had a fantastic introduction to the Yorkshire Dales. The walk is named after James Herriot; the fictional name given to the real-life veterinary surgeon who lived and worked in the Dales for many years. In life James Herriot was really Alf Wight and parts of this walk are first described in his book “James Herriot’s Yorkshire”, a coffee table book with stunning photographs by Derry Brabbs. From that informal beginning as a short narration in a book, the walk is now a well known long distance path, following established Rights of Way along its whole length, either footpaths or bridleways and these are nearly always signposted clearly. The Walking the Herriot Way guide book provides a detailed, step-by-step route description and a series of hand-drawn, annotated maps, as well as a wealth of information to help plan the walk. The Herriot Way is approximately 52 miles (84 km) long, with an overall height gain of around 7,700 feet (2,350 m) and an equal amount of descent of course, as it is a circular walk. The toughest section is likely to be the day that includes the ascent of Great Shunner Fell and although this involves a long steady climb, it is not steep, the path is generally good and is even paved for long sections to protect the peat bogs. The walk should be well within the limitations of a regular walker or someone with a good level of fitness. The individual day walks themselves are not too arduous, but the fact that they come one after the other in quick succession does mean you need to be adequately prepared. 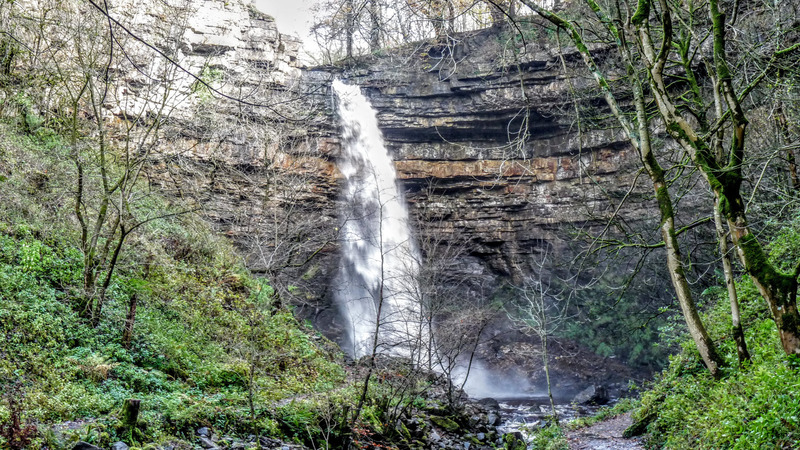 The route is designed around the four villages of Aysgarth, Grinton, Keld and Hawes and as such is generally considered to be a four day walk. This four day itinerary also means it is broken down into four equal stages of about 13 miles (21 km) each day. The traditional starting point of the Herriot Way is Aysgarth. 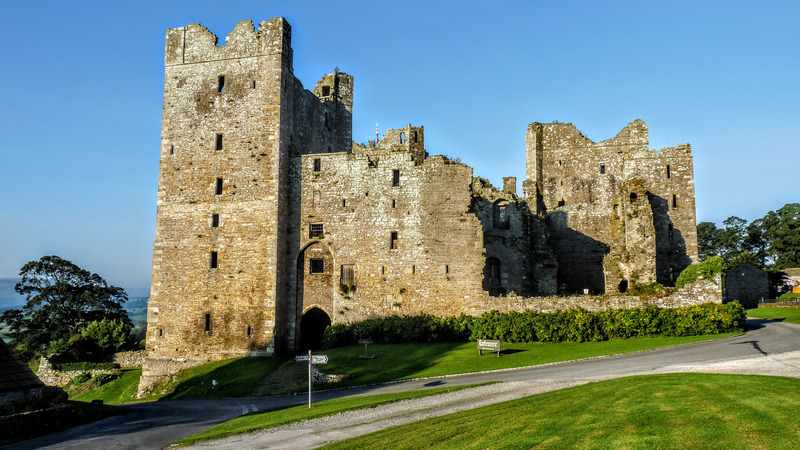 This guide describes the walk as starting and ending here, however as a circular walk, you could start at any point along its length. These are some of the most frequently asked questions about this walk, with answers. The Herriot Way guide book is written for a clockwise walk (although there is a digital version for anyone wanting to walk anti-clockwise). Baggage transfer providers typically work in a clockwise direction and some B&Bs provide a pick-up and drop-off service that may restrict the direction you take. There is something to delight all walkers on the Herriot Way. If you love walking beside rivers there is the wonderful section beside the River Ure in Wensleydale. If high remote hills are your idea of heaven then the ascent of Great Shunner Fell will be your highlight. Lovers of grouse-filled, heather moorland will revel in the crossing of Melbecks and Harkerside Moors. The diversity of the scenery encountered along the relatively short 52 miles of the Herriot Way are what set it apart from the other long walks in the UK. The feeling of remoteness while still being within easy reach of civilisation every day and the mix of easy strolling through the dales and the strenuous ascent of Great Shunner Fell make it a perfect candidate for your first long distance walk. The barren wasteland above Gunnerside, created by the lead-mining industry of the 19th Century is not to everyone’s taste; likened to a moonscape it will be a long time before Mother Nature reclaims it. Walkers will visit a diverse array of remains from the Lead Mining industry that was prevalent through this area of the Dales for many years. Subtle information boards provide an insight into how hundreds of miners lived and worked in this desolate environment, changing and shaping it forever. The Herriot Way is the perfect walk for a first-time long distance walker, or for an experienced walker looking for a leg-stretcher. The 52 miles are broken into four approximately equal 13 mile days, each one ending in villages with plentiful local amenities. The good mix of strenuous sections and easy walking through lowlands, beside the wide River Ure make for an interesting walk, giving you a taste of the different kinds of walking available in Northern England. Accommodation is plentiful at the end of each of the 13 mile section and some days have villages perfectly positioned for a pub lunch. The route could be wild-camped or make use of camp sites along the way. Some sections are supported by local bus services but the nearest train station is about 15 miles from the route, so getting to the start requires planning. If you like to walk high, then park in Keld and catch the bus to Reeth, walking back to your car over Melbecks Moor and down the wonderful Swinner Gill. If you prefer a low level walk then use the bus between Hawes and Aysgarth to walk beside the Ure. Hardraw Force - very impressive after heavy rains. What an excellent walk! The book was brilliant and described every section in detail. Although we had the OS map, we used the book as our main source of navigation. Can highly recommend this book and the walk! My wife and I have just completed The Herriot Way and taking four days on the walk, starting at Aysgarth. The directions and the attention to detail within was outstanding. Only had to look at the OS map once! My wife and I have done the Herriot Way twice now, and enjoyed both equally. Your superb guide was invaluable , never went wrong and the information made the walks really interesting. I can not compliment it highly enough. Just completed the Herriot Way yesterday with a couple of friends. Absolutely brilliant walk and stunning weather. The book was absolutely fabulous for most of the walk with so much detail. The only bit we got caught out on was the short cut on day four which was the least detailed, however combined with the os map for that part no problems were encountered. Thank you so much !!! Definetly would recommend anyone to buy this book prior to the walk! We completed the Herriot Way over the Easter Bank holiday weekend. What an excellent walk! As seasoned long distance walkers we have been looking for some shorter, yet still challenging, long distance walks and we thoroughly enjoyed this one! The book was brilliant and described every section in detail that, despite walking through quite a lot of snow ( 2 out of the 4 days were in heavy blizzard conditions!) we had no problems navigating as the descriptions in the book were so clear and concise. Although we had the OS map, we used the book as our main source of navigation. Can highly recommend this book and the walk! We started at Aysgarth. The directions and the attention to detail within was outstanding. Only had to look at OL30 once! The only part we struggled with was actually locating grouse butts 7 and 8 after High Harker Hill. They are very well hidden. Day 3 is also hard work if you take the high route through the lead mines from Keld to Reeth. We both thoroughly enjoyed the experience and are now planning our second LDW. My wife wants to know if you’ll do directions for every other trail?!! Thanks and well done on the guide. Just wanted to say the book was great. Myself and Julie found we needed only to follow the book and not the OS map. This walk is an ideal pre-season warm up for a regular long distance walker or in my case an ideal one if your other half isn’t as keen a walker as you are. My wife and I completed it last week and the scenery is truly stunning and the waterfalls, due to recent rain, were in full spate and spectacular. There are ideal lunch stops on all 4 days and plenty of other pubs/tea rooms along the way to keep the missus happy. Stayed at Cornlee guest house at the start, youth hostels at Hawes and Grinton and even a Yurt at Keld which was great. Took a OS map with me but didn’t really need it as guide book is so easy to follow and fits nicely into a jacket pocket. On day 3 we did take the low level route as described in the C2C guidebook as weather was a bit iffy and wanted to visit Muker and Gunnerside where tea and cake is plentiful. My wife and I have done the Herriot Way twice now, and enjoyed both equally. Your superb guide was invaluable , never went wrong and the information made the walks really interesting. Thanks for the hard work you have put into the guidebook, I can not compliment it highly enough. I would not hesitate to recommend it to anyone. I did the Herriot Way as my first solo walking trip and could not have done it without this excellent, invaluable book. Not one wrong turn, which for me is a miracle! Contemplating doing the longer Dales Way next. Stuart, have you a similar guide/route for the Dales Way? It was the end of July 2014. The weather was great: sunshine, dramatic clouds, a few drops of rain one afternoon. The walk was unsurpassable. I promise you I could not have done it without the book. You read ahead 3 or four next stages, then stuff the book in your pocket and forge ahead with confidence, fully trusting the guide, enjoying the scenery, taking pictures of a bird or rock or sheep or barn or grand vista… Until you need to get your bearings again. A rare experience. my maps at all. Just bought the second book By Stuart The Tributaries Walk, hoping to do it in October. This book is fantastic and is a’ must have’ for this walk. The book was so easy to follow, keeping us on the right path. While I have no doubt we would have got between the four main points, your book took us along some paths that I don’t think we would have found. At times it felt you were the 5th member of our team! For anyone thinking of doing the Herriot way – take this book! Stuart, your book is just fabulous! I found it so detailed and with the maps I always felt confident and safe on the Herriot way, especially around those grouse butts where it can be really hard to see any path. I look forward to using it again another time. I have to pay you a big compliment for your nice book. There’s a lot of work standing behind it and it shows from every page how much you care about the Herriot Way. Your book is so incredibly detailed, down to the last blade of grass and yet with the maps, you get a complete overview of the walk and only need to look at the text intermittently.